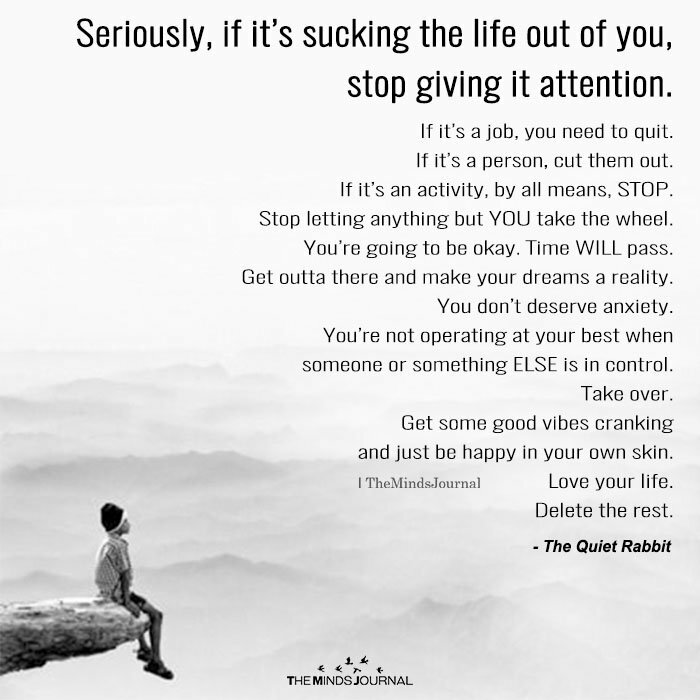 Seriously, if it’s sucking the life out of you, stop giving it attention. If it’s a job, you need to quit. If it’s a person, cut them out. If it’s an activity, by all means, STOP. Stop letting anything but YOU take the wheel. You’re going to be okay. Time WILL pass. Get outta there and make your dreams a reality. You don’t deserve anxiety. You’re not operating at your best when someone or something ELSE is in control. Take over. Get some good vibes cranking and just be happy in your own skin. Love your life. Delete the rest. Too true though hard to be executed!! !